Alongside routine maintenance care of the feet, which involves removal of corns, callus and nail cutting, at Better Health, we provide specialist care and advice for people with diabetes and arthritis. Minor surgery can also be performed to remove problem toenails. Anomalies in how we walk can also be assessed and treated by the podiatrists. Orthotics (shoe inserts) can be prescribed to improve foot function and reduce pain caused by poor foot posture (such as ‘fallen arches’ or ‘flat feet‘). Our resident Podiatrist brings a wealth of knowledge and experience to treating injury and disorders of the feet & legs. Our approach in diagnosing, treating and managing patient needs is highly personal and individualized; caring, and driven by achieving the most optimal outcomes that facilitate a better life and better health. Our holistic approach to Podiatry takes the practice beyond conditions specific to foot and leg, to strengthen and enhance higher body centers. Many structural anomalies are due to improper positioning of the pelvis and spine. Poor foot and leg structure and function can cause imbalance in pelvic and spinal rotation. In such cases podiatry treatment in conjunction with other services – such as chiropractic or physiotherapy – will facilitate better recovery, and better long-term body functioning and health. At Better Health Podiatry, we frequently advise parents who are concerned about the development of their children’s feet. Compromised posture, pain or unusual walking patterns are other reasons why they will consult the practice. Often only reassurance and postural exercise is required but sometimes specialised orthoses or other forms of treatment are indicated. In some instances video gait analysis is required to study a child’s walking pattern so as to determine the extent of the problem. 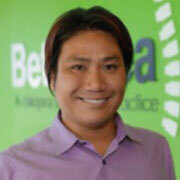 David is the resident podiatrist at 2 of Sydney’s largest multidisciplinary paediatric practices. These are Therapies for Kids (Annandale), and the NAPA Centre (Lane Cove West). Many of the clients he consults here are children with special needs. He works directly alongside the Physiotherapists and Occupational Therapists at these Centres to obtain the best possible outcomes in aiding abnormal gait in children. Types of conditions he frequently consults are Cerebral Palsy, Autism (ASD), Downs Syndrome, Toe Walking, and Developmentally Delayed. Just like a Paediatrician is a medical specialist in Children, David is the equivalent for children’s feet. Podo Paediatrics is a specialty in its own right. 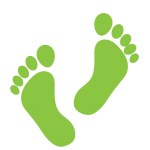 The normal values for children’s feet are very different to those of adults. Whilst General Podiatry Practices (which treat majority adult patients), will treat children, it is best to have a Podo-paediatrician to assess and treat your child. For instance, at a General Podiatry Practice, a child aged 3 with flat feet may be prescribed orthotics for flat feet. However, every child aged 3 has flat feet, thus treatment may not actually be needed, as the child is within the norm for their age group. The theory behind sensomotoric foot orthotics revolves around the natural response of the foot and body in relation to how the ground is felt by the feet. The orthotics are designed to alter how the foot ‘feels’ the ground in particular the timing of ground contact. The body has a preferred movement pattern whether it is the best pattern for you or not. These orthotics are a flexible dynamic orthotic, and help to retrain muscles to more correct muscle movement. These orthotics are particularly useful in treating neurological problems in children such as Cerebral Palsy, Autistic Spectrum Disorder, Idiopathic Toe walking, Delayed Physical Milestones, and can help with general clumsiness. Over time, high blood glucose levels can damage the nerve systems in your body, stopping important messages getting to and from your brain. As the nerves to your legs and feet are the longest ones, they are most likely to be affected. Complications of Diabetes can be foot ulceration, infection, abnormal foot shape and unfortunately amputation. David has extensive experience in the Diabetic Foot. He is still practicing as Senior Podiatrist at the RPAH Diabetes Centre High Risk Foot Clinic. All people with Diabetes should have their feet assessed on a yearly basis to check for any Diabetes related foot complications. At Better Health we can perform a complex neuro-vascular assessment as we have a Vascular Doppler to further investigate any vascular insufficiencies, plus a Biosthesiometer which can determine the level of severity of Peripheral Neuropathy. Once we know your risk level for developing Diabetes related foot complications, we will be able to provide appropriate foot education, and advise on frequency of visitations for podiatry. If you have Diabetes, you should have your feet checked up at least once a year. Many injuries and conditions that are encountered occur as a consequence of an inherent abnormality in walking and it is only after diagnosing such abnormalities in normal “gait” that an precise and highly specific treatment plan can be created. conditions which are likely to have arisen as a consequence of biomechanical discrepancies and overuse. the analysis of children with walking abnormalities, with specific knowledge of normal values in children. those individuals with complex injuries which have not responded to other treatments. professional and recreational athletes of all standards who are prone to injury. With video gait analysis, the body is analyzed comprehensively to shed light on the various imbalances which may be contributing towards the patient’s complaint. The information is cross referenced against the medical history and examination and biomechanical assessment. It is a simple fact that men and women who enjoy sports – whether professional or amateur – suffer more foot-related sports injuries. Running can increase the pressure on the foot by three times the body weight. The twisting, jumping and physical accidents common in many sports, place even greater stresses on the feet and biomechanical system. The cause of many sports injuries is a gradual or sudden change to the body’s biomechanics. By correctly diagnosing the cause for a condition by means of biomechanical and gait analysis we can then adopt treatment strategies to resolve the condition. Better Health Practice has an extensive range of treatment modalities including specialist rehab techniques, orthotic interventions, and extracorporeal shockwave therapy.